Day 03 Kathmandu to Jiri by bus. Bus ride will take approximately 9hrs. Triail ascent and descent. Trek start at the end of the paved road in Jiri. It is short level walk through deep forests, following the narrow stone path. Crossing the stream and going uphill through trees. Today the trail ascent 900m and it descent 600m. it continues crossing stream on a wooden bridge and passing through forests. Trail descends through the fields to stream. Cross the suspension bridge at Kenja. Where it has police checkpost. The trail climbs steep uphill to reach to Sete. The route enter to Land of sherpa. From sete to the top of Lamjura Bhanjyang(3530m) the way is scenic and varied. Trail pass through moss-covered rhododendron, magnolia, maple and birch trees. It is a delight for the bird lover. Trail continues ascent and descent through forest ,crossing streams on a wooden bridge and a suspension bridge. Passing through shepa villages and Mani walls. 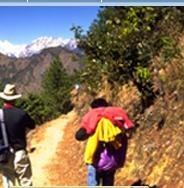 Trail descent to Dudh kosi river. Cross the suspension bridge and pass through terraced fields to reach to Khari khola. From here trail climbs to the ridge in Bupsa. Past the settlement of kharte and forests .keep climbing up to a cleft in the rock till ridge. Trail descent to puiyan khola. After crossing the bridge trail goes ups and downs to another ridge that offers a good views of Khumbu region. After3/4 hours trek (normally) 0ne may have another excellent opportunity to be at Tayanboche Monastery. It has been reconstructed as it was completely destroyed by catching fire in 1988. The magnificent views of Mt. Kwangde( 6187m), Twache(6542m), AmaDablm(6856m) Everest(8848m) Nuptse, Lhotse Thamserkhu are visible. 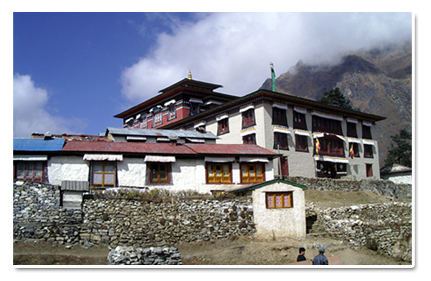 The trail climbs through a grass carpeted valley to Khumbu Glacier and reaches Dughla. To view Mt. Everest(8848m) has to hike up to the Kalapatthar'black rock' and for camping back to the lobuche. Trail descends to Pangboche easier to come down. Day 20 Fly to Kathmandu for 45 minutes from Lukla.